Are you someone who has always been intrigued by a challenge or finding the needle in the haystack? A courthouse or title researcher does just that. This little-known job is popular among stay-at-home moms and retirees. Getting started takes time, but the business is steady. What Is a Title or Courthouse Researcher? A courthouse researcher is an independent contractor who researches public records to gather information for their client. You could be researching anything from genealogy, property records, titles, probate cases, tax liens, or even criminal records. While a courthouse or title researcher is considered a work-at-home job, sometimes it might be necessary to actually go into the county courthouse to conduct the research, while other times you might be able to find the online version of the records you're looking for. If you have to do research in a courthouse, you are governed by their hours, which are usually between the hours of 9 a.m. and 5 p.m. and on weekdays only. The good thing is that you're able to be flexible with your own hours, especially when you're able to work from your home. 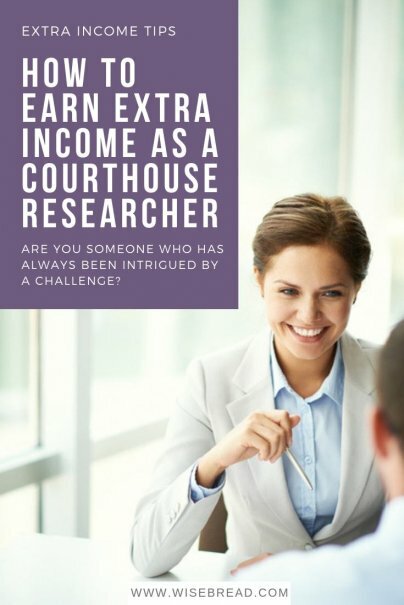 No specific degree or education is required to become a courthouse researcher, which can make it appealing to anyone who is looking for supplemental income. Some companies will help to train you, but you'll want to be familiar with a courthouse setting and where they keep their records. You can always ask for assistance within the courthouse, too. The income you can expect for being a courthouse researcher varies greatly by the companies you work for and your speed. Speed and accuracy are incredibly important in this field, and the faster you're able to find and collect a record, the faster you're able to move onto the next one. As an entry level researcher, you might be making about $0.25–$0.30 a record. Once you're able to get comfortable in the position and have learned how to quickly locate records, you can expect earnings to increase. As of April 2015, the average annual salary of a courthouse researcher is $48,000. Some jobs might require that you travel to neighboring county courthouses, which will add additional costs in the way of mileage and fuel fees. If you keep track of your mileage, it makes a good deduction when you file your taxes. Seasoned researchers have also found it useful to get to know the employees at the local courthouse, network, and leave a business card. According to one researcher with years of experience, it's not uncommon to get work in this field by checking the bulletin boards found at the entrances and common areas of the courthouse itself. Does becoming a courthouse researcher interest you?